Lets trace the history and development of anabolic steroids from their beginning to their present day. We first need to look back towards ancient times, when it was known that the testicles were required for both the development and maintenance of male sexual characteristics. In modernity, this concept was further developed, by a scientist named Berthold and his experiments on cockerels done in 1849. He removed the testes from these birds, and they lost several of the characteristics common to the male of their species, including sexual function. So, we knew as early as 1849 that the testicles functioned to promote what we consider to be primary male sexual properties; in other words, they are what “MAKE MEN into MEN”. Berthold also found that if the testicles were removed and then transplanted to the abdomen, the sexual function of the birds was largely unaffected. When the birds were dissected, it was found that no nervous connections were formed, but a vastly extensive series of capillarization took place. This provided strong evidence that “the testes act upon the blood” and he further concluded that this blood then had a systemic effect on the entire organism. Anabolic Steroid history, therefore, can be truly said to have made its first step with this simple series of experiments. Later, in 1929 a procedure to produce an extract of potent activity from bull’s testicles was attempted, and in 1935 a more purified form of this extract was created. A year later, a scientist named Ruzicka synthesized this compound, testosterone, from cholesterol, as did two other scientists, Butenandt and Hanisch. Testosterone was, of course, the first anabolic steroid ever created, and remains the basis for all other derivations we have currently being used in medicine today. Testosterone was then used in 1936, in an experiment demonstrating that nitrogen excretion of the castrated dog could be increased by giving the dog supplemental testosterone, and this would increase its body weight. Shortly after this time, the Nazi´s were rumored to have given their soldiers anabolic steroids, but that rumor seems to be largely undocumented. Later, further experiments were carried out in men, of course showing that testosterone was a potent anabolic substance in humans. Later, between the years of 1948 and 1954, the pharmaceutical firms Searle and Ciba had experimented with the synthesizing of over a thousand different testosterone derivatives and similar analogues. In 1954, a physician named John Ziegler attended the World Weightlifting Championships in Vienna, Austria, as the team’s doctor. The Soviets dominated the competition that year, easily breaking several world records and winning gold medals in legions of weight classes. According to anecdotal reports, Ziegler invited the Soviet´s team doctor to a bar and the doctor told him that that his lifters had used testosterone injections as part of their training programs. Whether that story is true or not, ultimately, the Americans returned from the World Championships that year and immediately began their efforts to defeat the Soviets using pharmaceutical enhancement. As you may have expected, when they returned to the United States, the team doctor began administering straight testosterone to his weightlifters. He also got involved with Ciba, the large pharmaceutical firm, and attempted to synthesize a substance with strength enhancing effects comparable or better than testosterone’s. In 1956, Methandrostenolone was created, and given the name “Dianabol”. In the following years, little pink Dianabol tablets found their way into many weightlifter´s training program, fast forward a few years, and in the early 1960s, there was a clear gap between Ziegler´s weightlifters and the rest of the country, and much less of one between them and the Soviets. It was also in the 1960´s that another anabolic steroid had been developed and used to treat short stature in children with Turner Disease syndrome. At this time, physicians around the United States began to take notice of steroids, and numerous studies were performed on athletes taking them, in an effort to stem the tide of athletes attempting to obtain steroids for use in sports. The early studies on steroids clearly showed that anabolic steroids offered no athletic benefit whatsoever, but in retrospect can be said to have several design flaws. The first issue with those studies, and the most glaring one was that the doses were usually very low, too low to really produce much of an effect at all. In addition, it was neither common for these studies to not be double blind nor to be randomized. A double blind study is one where neither the scientists nor the subjects of the study know if they are getting a real medication or a placebo. A randomized study is where the real medicine is randomly dispersed throughout the test group. Finally, in those early studies, nutrition and exercise was not really controlled or standardized. Not long after those flawed studies were concluded, the Physicians Desk Reference boldly (and wrongly) claimed that anabolic steroids were not useful in enhancing athletic performance. Despite this, in 1967, the International Olympic Council banned the use of anabolic steroids and by the mid 1970´s most major sporting organizations had also banned them. Just prior to the ban on steroids in the Olympics, the German Democratic Republic (GDR) began a program with the goals of synthesizing new anabolic steroids for their athletes to use in various sports. Their body of research remains the most extensive collection of information on the use of steroids in athletes ever complied. Despite the small size of their country, they managed to consistently dominate the top ranks of various sports, competing with both the United States and the Soviet Union for total medals in both the Olympics and various World Championships. In 1972, the IOC began a full scale drug-testing program. By 1982, the International Olympic Council had developed a test for the detection of excess levels of testosterone in athletes, known as the “Testosterone: Epitestosterone test”. In this test, levels of testosterone vs/ epitestosterone are measured, and if the testosterone level is 6x that of the epitestosterone level, it can safely be concluded that some form of testosterone has been used by the athlete. This is because testosterone is commonly no more than 6x the natural level of epitestosterone found naturally in the body. Thus, if there were more than that ratio, it was not naturally occurring, in all probability. The IOC was, as usual, one step behind the athletes. The GDR had already done a study on their athletes using a form of testosterone which would leave the body quickly, and thus they would be ready for the IOC test within three days of their last injection. They then developed a protocol to allow their athletes to continue steroid use, ceasing it only long enough to pass the drug test. In addition, the German firm Jenapharm, who had been supplying the government with steroids for their athletes, developed an epitestosterone product to administer to athletes to bring the ratio back to normal without discontinuing steroid use. Their doping methods were so advanced, however, that they remained undetected for many years, until late 1989 when information was leaked to the western media about a government sponsored program of systematic anabolic steroid administration and concealment. Eventually, in the early 1990´s, the Germans had finally gotten caught, and the ensuing scandal was one which helped give anabolic steroids the bad reputation they have had ever since. Ironically, it was also in the early 1990´s that anabolic steroids had started to be used by the medical community to improve survival rates of AIDS and Cancer patients, when it was discovered that loss of lean body mass was associated with increased mortality rates respective to those diseases. A similar story was being played out in the United States at about that same time. Before 1988, steroids were only prescription drugs, as classified by by the FDA (Food and Drug Administration). FDA determines which drugs will be classified as over-the-counter versus those which will only be available through prescription. At this time, the Federal Food, Drug, and Cosmetic Act, was invoked to restrict the access of steroids, making them available only by prescription. They were still not controlled substances at this time, however. A “Controlled substance” is one that is more firmly regulated than uncontrolled prescription drugs. As an example, contact lenses can only be legally purchased with a prescription, but they are not “controlled” per se. This stricter control of steroids created a vastly more intense examination of the doctors prescribing them; and of course, more harsh penalties for wrongful dispensing. 1988 also marked the passage of the Anti-Drug Abuse Act, which put steroids in a totally different prescription category, one that stipulated very severe legal penalties for illegal sale or possession with intent to distribute. Now, steroid possession and/or distribution was considered a felony. Next, the United States Congress added steroids to the Controlled Substances Act as an amendment known as the Anabolic Steroid Control Act of 1990. Steroids were now placed in “Schedule III” classification, along with amphetamines, methamphetamines, opium, and morphine, and carrying the same penalties for buying or selling them. This legislation and classification was passed without the support of the American Medical Association, the FDA, the DEA, and the National Institute on Drug Abuse, all of whom actually protested the federal and state lIn the early part of the new millennium, steroids have again been pushed to the forefront of the news by the introduction of “prohormones” which were first developed and marketed by Patrick Arnold. It is at this point that the history of steroids in baseball begins to become more prominent; this is in all probability because Major League Baseball had no steroid testing program in effect during this time. During his epic quest to break Roger Maris home-run record, Mark Maguire was spotted by a reporter to have had a bottle of Androstendione in his locker. Although androstendione is not a steroid, and is simply a prohormone, the word /spanym-buyer, as did demand and unfortunately, the prevalence of fake or counterfeit steroids. Steroids remained in the media, occasionally making an appearance when an athlete tested positive, or admitted using them, but for another decade, they remained uncharacteristically out of the medias attention. In the early part of the new millennium, steroids have again been pushed to the forefront of the news by the introduction of pro-hormones which were first developed and marketed by Patrick Arnold. It is at this point that the history of steroids in baseball begins to become more prominent; this is in all probability because Major League Baseball had no steroid testing program in effect during this time. During his epic quest to break Roger Maris home-run record, Mark Maguire was spotted by a reporter to have had a bottle of Androstendione in his locker. Although androstendione is not a steroid, and is simply a pro-hormone, the word steroid was again found circulating in the news on a nightly basis. Not shortly after Roger Maris record was broken, another baseball player, Jason Giambi and various other athletes were either suspected of, or proven to have, taken anabolic steroids. Again, Congress convened a hearing, and just as they did the first time in 1990, they did not determine that steroids were a danger, but rather that the danger was more in protecting professional sports organizations. 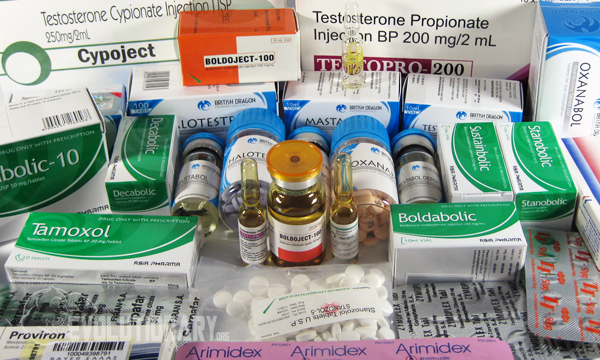 The updated statute has been updated to proscribe pro-hormones also The definition of an anabolic steroid as defined currently in the United States under (41)(A) is that “anabolic steroid” means any drug or hormonal substance, chemically and pharmacologically related to testosterone (other than estrogens, progestins, corticosteroids, and dehydroepiandrosterone. Currently, steroid use is far from declining. Among 12th graders surveyed in 2000, 2.5% reported using steroids at least once in their lives, while in 2004 the number was 3.4%. A recent internet study also concluded that anabolic steroid use among weightlifters and bodybuilders continues, and by all accounts, there are no signs of it stopping in athletics any time soon.